The p-block elements are put to the right-hand side of the periodic table in groups from 13 to 18. In the iotas of p-block elements, the separating electron enters the valence p subshell. In this manner, in these elements, the n p subshell is step by step filled. The general valence shell electronic setup of group fifteen elements is ns2, np1-6. The electronic design of helium is 1s2. Disregarding the way that helium does not have p orbitals, it is a p-block element since it takes after that of other p-block elements of the eighteenth group concerning their physical and compound properties. P-block elements are generally non-metals, while the remaining are metalloids and metals. Fig. 1: Elements of group 15 with their atomic number, electronic configuration, group number and period number. Group 15 elements include nitrogen, phosphorus, arsenic, antimony and bismuth. Nitrogen is the real constituent of the world's air, and records for 78% of it by volume. It is the primary member of this group and happens in a free state as a diatomic gas, N2. Minerals of Nitrogen: Indian saltpeter and Chile saltpeter. It is additionally found as the fundamental constituent of proteins, nucleic acids, amino acids,  and catalysts. The following element in the group is phosphorus. It is the eleventh most copious element in the crust of the earth. In the consolidated state, it occurs as minerals as phosphates. Example: Fluoroapatite, Chlorapatite, and Hydroxyapatite are a few. Phosphorus is a fundamental constituent of animal and plant matter. Phosphate groups are constituents of nucleic acids, that is, DNA and RNA. Around 60% of bones and teeth are made out of phosphates. Phosphoproteins are available in egg yolk, milk, and bone marrow. The rest of the elements of the group, that is, arsenic, antimony, and bismuth, mostly happen as sulfides. Example: Stibnite, Arsenopyrite, and bismuth glance. The separating electron in the elements of group 15 enters the n p subshell. Thus, the valence shell electronic arrangement for these elements becomes ns2 np3. There are five electrons in the valence shell of these elements. Because of the precisely half-filled electronic arrangement of the 'n p' subshell, the elements of this group are genuinely steady and stable. Example: Dinitrogen is an inactive gas under ordinary conditions. Moving down the group, the ionic radii, and atomic radii increases because of the expansion of another main energy level in each progressive element. These elements demonstrate higher values of ionization enthalpy when contrasted with group 14 elements. This is because of their higher atomic charge, smaller nuclear radii, and stable half-filled electronic setups. As we move down the group, the ionization enthalpy values diminish. This is because of the progressive increment in the nuclear size. Electro negativity is the inclination of a particle to pull in a shared pair of electrons more towards itself. The electro negativity diminishes bit by bit on moving down the group because of the increase in atomic radius. Physical properties incorporate physical state, boiling and melting points, metallic character, allotropy, and density. Nitrogen is a diatomic gas, while the rest of the elements are solids in nature. 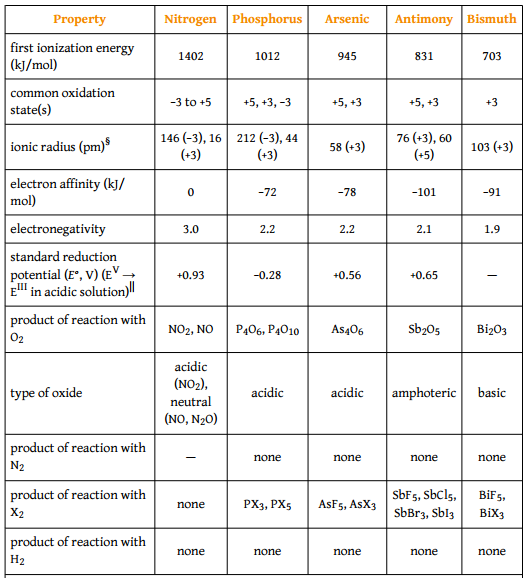 Moving down a group, metallic character increments and the ionization enthalpy of the elements diminish with an increase in their nuclear size. The melting point increments from nitrogen to arsenic because of the continuous increment in nuclear size. The low melting point of nitrogen is because of its discrete diatomic particles. Then again, the high melting point of arsenic is ascribed to its goliath layered structure in which the layers are firmly pressed. In spite of the fact that the nuclear size increments from arsenic to antimony, there is a decrease in their melting points. Despite the fact that antimony has a layered structure, it has a low melting point than arsenic on account of the generally free pressing of particles. Furthermore, the melting point of bismuth is not as much as antimony because of the packing of atoms loosely by metallic holding. Then again, the boiling point step by step increments from nitrogen to bismuth. The density of these elements increases from nitrogen to bismuth. 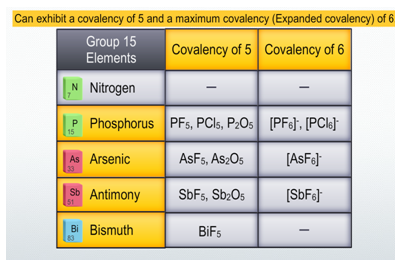 All group fifteen elements, aside from bismuth, indicate allotropy. Nitrogen is found in two allotropic structures, that is, alpha nitrogen and beta nitrogen. Phosphorus exists in numerous allotropic structures. Of these, the two critical allotropic structures are red phosphorus and white phosphorus. Arsenic exists in three essential allotropic structures - black, grey, and yellow. Antimony additionally has three essential allotropic structures, to be specific, yellow, metallic and explosive. Every one of the elements of group 15 has 5 electrons in their outermost circle. They require just 3 electrons to finish their octet setup. The octet can be accomplished either by picking up 3 electrons or by sharing 3 electrons by a method for covalent bonds. Accordingly, the basic negative oxidation state of these elements is - 3. Moving down the group, the propensity to display - 3 oxidation state diminishes. This is because of the expansion in nuclear size and metallic character. Group 15 elements additionally indicate positive oxidation states of +3 and +5 by developing covalent bonds. Because of the inert pair effect, the +5 oxidation state stability diminishes down the group, while that of +3 oxidation state increments. Nitrogen has just s-and p-orbitals, yet no d-orbitals in its valence shell. Therefore, nitrogen can demonstrate a most extreme covalency of 4. A covalency of four is reached by the sharing of its lone pair of electron to another iota or particle. Phosphorus and the rest of the elements can display a covalency of five and a most extreme covalency, additionally called extended covalency of six. This is conceivable as a result of the nearness of empty d-orbitals in the valence shell. Every one of the compounds of group 15 elements, which display a +5 oxidation state, are covalent. Fig. 4: In case of +3 oxidation state, both ionic and covalent compounds are formed. Fig. 5: In group 15 elements, the covalent character decreases from nitrogen to bismuth. Nitrogen, in light of its small size, high electro negativity and solid propensity to shape p pi – p pi numerous bonds, it shows different oxidation states from - 3 to +5. If there should arise an occurrence of nitrogen, all oxidation states from +1 to +4 in acidic solution tend to disproportionate. In phosphorus, almost all transitional oxidation states in alkali and acid disproportionate into +5 and - 3. Generally, the principal element of any group varies from rest of the elements regarding their properties. 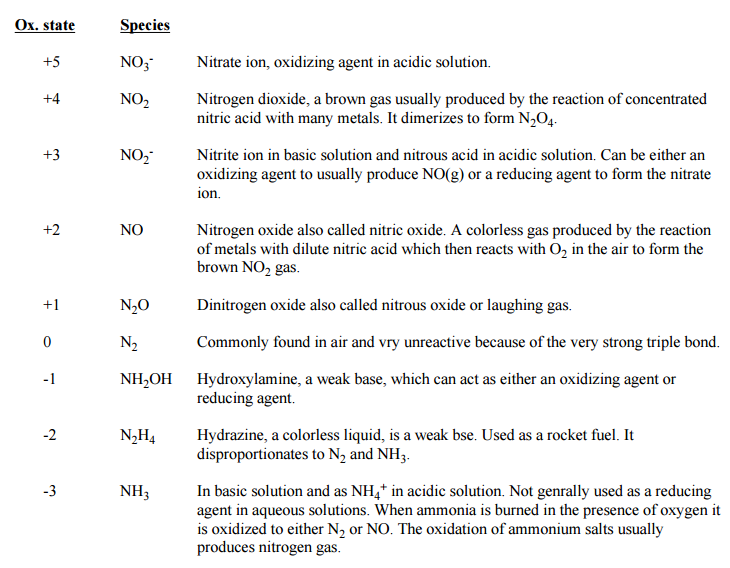 Nitrogen varies from other elements in its properties. 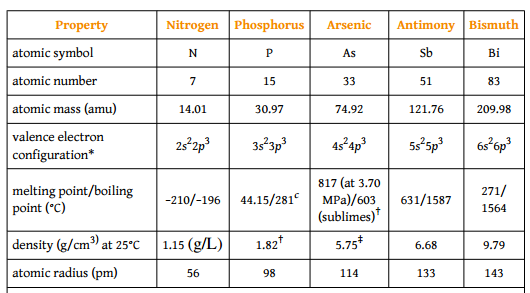 The exceptional properties of nitrogen are credited to its small nuclear size, high ionization enthalpy or high electro negativity, the non–availability of d-orbitals and the possibility to shape various bonds. No one but nitrogen can shape nitride particles by picking up electrons because of its high electro negativity and small size. Nitrogen, being smaller in size, can successfully shape p pi – p pi bonds with different molecules of different elements with a small size and high electro-negativity, for example, oxygen and carbon. Alternate elements don't shape p pi - p pi bonds in view of their moderately bigger size. Synonymously the p orbitals of these elements are bigger in size. Dinitrogen is a diatomic particle with a triple bond between the two molecules. The different elements in the group, for example, phosphorus, arsenic and antimony, exist as tetra atomic particles. In every one of these particles, just single bonds are available between the iotas or atoms. But bismuth in its elemental state shapes metallic bonds. The catenation inclination is less for nitrogen when contrasted with alternate elements of the group. This is on the grounds that there are higher inter- electronic repulsions amongst the lone pair of electrons present on the nitrogen atoms. The high inter- electronic aversions in dinitrogen are credited to its small bond length or little size of nitrogen particles. Nitrogen does not shape d pi – p pi bonds because of the missing d orbitals. Phosphorus can frame d pi – p pi bonds. Example: Triethyl phosphate and Phosphorus Oxo chloride. Due to the accessibility of empty d orbitals in the rest of the elements of group 15 they frames compounds, for example, triphenyl arsine and triethyl phosphine, shape d pi – d pi bonds with transition elements. Every one of the elements of group 15 forms EH3 type hydrides.Here E can be any element of group 15 such as nitrogen, phosphorus, arsenic, antimony or bismuth. The inertness of hydrides decreases from ammonia to bismuth. This is on account of the fact that the central atom E increases in size down the group. With this increase in the central atom's size, the E – H bond gets to be distinctly weaker. With the expansion in size, the covering between the orbitals of E and hydrogen will not be powerful. This is the reason for the decrease in the inertness of hydrides moving down the group. Hydrides formed from group 15 elements are very strong reducing agents. There is an increase in the reducing character of hydrides from ammonia to bismuth because of a reduction in the quality and strength of the E – H bond down the group. Bismuth is the strongest reducing agent among every one of the hydrides of group 15 elements. The hydrides of these elements are basic in nature. They go about as Lewis bases because of the accessibility of a lone pair of electrons present on the central atom. With the increasing size of the central atom, there is a decrease in the basic character as we move down the group. The boiling point of hydrides decreases from ammonia to phosphine and afterward increments from phosphine to bismuth. A similar pattern is watched for their melting points. Two types of oxides are formed in group 15 elements. They are E2O3 and E2O5. Due to the inert pair effect Bismuth is not able to form oxides in +5 oxidation. Oxides formed from elements when in higher oxidation state are more acidic than that of the lower oxidation state. The acidic strength of oxides of nitrogen increases from N2O3 to N2O5. As we move down the group, the acidic character diminishes. As such, the basic character of oxides increases on moving down the group. On reaction with halogens all the elements of group 15 form trihalides and pentahalides with the general formula EX3 and EX5. Example:  NF3, PF3, AsF3, SbF3 and BiF3 are trihalides. All the trihalides of these elements, beside those of nitrogen, are consistent. Phosphorus, arsenic and antimony shape pentahalides in light of the closeness of empty d orbitals in their valence shells. Nitrogen does not shape pentahalides as a result of the nonappearance of a d orbital in its valence shell. Pentahalides are more covalent than the relating trihalides. Moreover, the covalent character of halides decreases from nitrogen to bismuth. Each element of group 15 react with metals to frame their binary compounds demonstrating - 3 oxidation state with the general equation,M3E2. Here, M remains for metals while E remains for an element of group 15. Example: calcium phosphide, calcium nitride, and so forth.